Let's face it, dual-screen phones like the Nubia X or the Vivo NEX Dual Display edition are unique when it comes to design. There have been efforts to tack an extra small screen somewhere on a phone before, but a fully functional second display on the back? That has been in the realm of concept renders and wishful thinking until now. Move aside, punch-hole screens and notches, dual-screen phones look unapologetically unorthodox, and sound like finding the Holy Grail on the neverending quest for "all-screen" handsets! What if you want to put them in a case, or try to find if their touted advantage of taking the best selfies by using the main camera really adds value? We are here to answer those pressing questions for you, complete with some camera samples from the Vivo against the best selfie-takers out there. When we got the Vivo NEX Dual Display edition, we delved in the box for the promised official case, curious what it would look like. Just a bumper, it turned out, wrapping the sides of the phone, while the front and rear displays have glass screen protectors installed from the factory, including the circular camera area on the back. 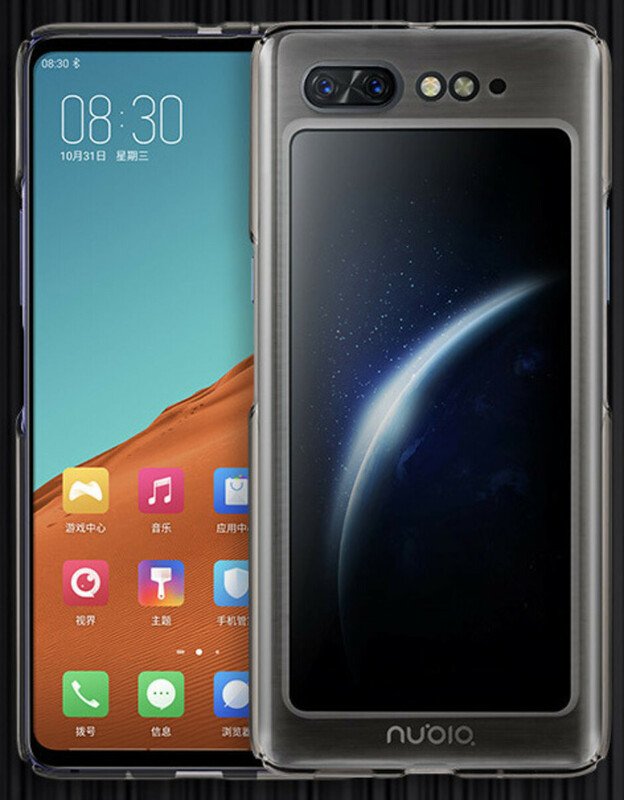 As far as the other dual-screen phone currently on the market, what you see below here is the official Nubia X case. The phone retails for about $600, and the case for $7 in China. Phrases like "soft-touch" and "perfect fit" are bandied about in the description, and we have to admit that Nubia takes it one step further than a bumper by simply cutting out an area on the back to reveal the secondary screen. Those two solutions still can't avoid one disadvantage that this unique dual display design brings - the rear screen or its protector gets smudged in fingerprint in no time while you are perusing the front one and vice versa. In addition, when you drop the phone now you have to worry about cracks or scratches on both screens unless it lands on a corner. Such an imperfect world. Another subtle imperfection is the battery endurance but not because there is something inherently more power-hungry in dual-screen phones, but simply because the second screen takes up space that could be used for some extra capacity. Other than that, the battery life should be commensurate with a single-screen phone, as the situations where you'd have both screens on simultaneously are pretty rare - using the rear display as a gamepad, for instance, or having always-on images on both sides of the phone. We noticed that the NEX draws quite a bit more power in standby this way, so turned the always-on imagery on the back screen off. Needless to say, the main point of having a second display on the back is so that the main screen can be as large as possible while you can use the main camera to snap selfies. What if the main camera delivers ho-hum quality, though? We snapped a few Insta-worthy selfies with the Vivo against the computational photography powerhouses of the Pixel 3 and the iPhone XS. The results? Well, see for yourselves but we'd have to give it to the dual-screen concept indoors and in low-lit conditions, predominantly in the detail department. What else can you use the dual screen for besides a mirror for taking selfies? An impromptu gaming pad, of course! That's right, the Nubia X lets you use the second screen on the rear as a gamepad of sorts, splitting it in two to allow playing racers and other simpler games without your fat digits obstructing the view. Needless to say, this would take an oversized toll on the battery life. Last but not least, you can have any combo of imagery you desire with a dual screen phone. Take out your Facebook feed or your Twitter messaging session on the back of the phone while you play a game on the main display. 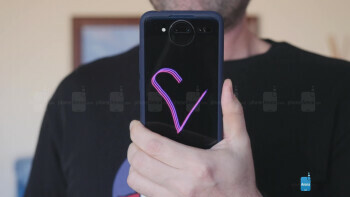 Make the rear screen display a hand-drawn heart or a celebratory when you unlock the phone - the possibilities are there and are likely to snowball from here. Are dual-display phones a practical solution to the "all-screen" problem? Not particularly, but they look unique nonetheless, and they take selfies as best as their main camera sensor could which in many cases is better indoors than your typical selfie cam. Would you get one? I think it's dumb. So many added cons all for a few% stb ratio. Bezels even the s8 and g6 size are fine. The notch is fine. Punch hole is fine. The real problem is the asymmetry with notch forehead and chin. Make a tiny uniform bezel like the XR. "Make a tiny uniform bezel like the XR" You mean "fat all-around" bezels like XR? OP6T and Honor View 20 chin is just as thick as XR's bottom bezel, but they have much thinner side and top bezels, which is a good thing. So many added cons? I can only think of battery life and it's not like you have to turn both screens all the time, I can't really think of many other cons. I think the Nubia X has the best implementation of the dual screen. The way they hid the screen on the back is pretty awesome. I feel the Vivo nex dual display and Nubia X both do a good implementation of the dual screen phone building on what the Meizu Pro 7 did. Hope to see more dual display devices with bigger batteries. People who think these phones are dumb and lame need to understand few things: This is a cool new tech. We should appreciate any new tech that comes out especially after the boring designs we keep crying about everyday. Look at the price tags. I mean for $600 this is super interesting and definitely worth a shot for people who can afford and are looking for a change. Aren't most phone backs glass panels already? What is the negative in making it screen too? People who say it's dumb. What are the reasons? Cuz u gotta flip it backward for selfies? How often do u selfie/Video call is it really inconvenient to flip a freaking phone backward? I guarantee u if Apple or Sammy does this, people will have zero problems with it. They can't be unique if there is more than one of them!